This level have 56 candies and all are with jellies plus this candy board is little bit difficult as last row at the bottom have single candy line that might need special candies. You have just 30 moves and it means you require special candies and you should try to combine with each other to break lot of jellies. 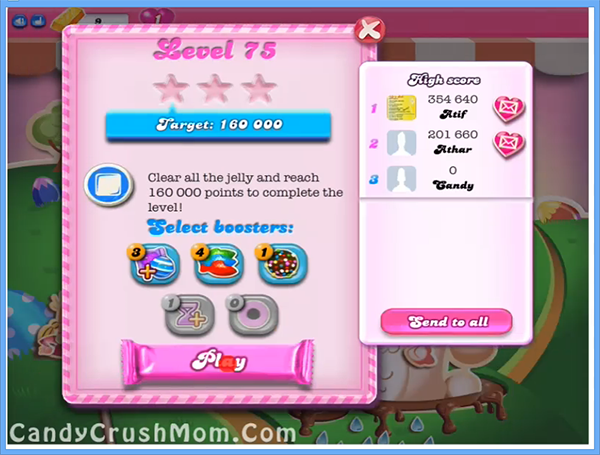 The best move that you can easily get is make colorbomb and striped candy that will help to break lot of jellies and can break all with less move then rest could convert to striped or fish booster that will help to get three star score. We completed this level with 190980 score by using special candies and got two colorbomb that we use with other special candies.